Looking for some really unusual yet cool ringtones for you cell phone? Here is list of tools/websites that will help you create your own ringtones or convert your MP3s into mobile phone friendly tunes. This service lets you upload a song from your computer or use YouTube video by simply entering its URL. Once uploaded, you are able to set the start and end point of your ringtone. Create, download and deliver the ringtone to your cellphone. The service is free to use and no sign up is required. 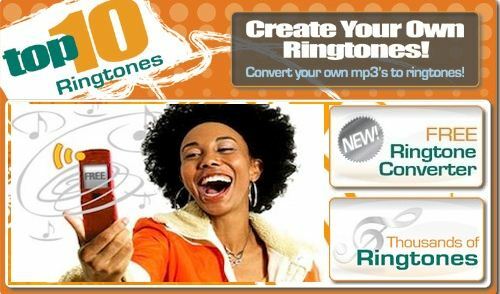 This online tool allows you to compose your own ringtones and download them to your cell phone. You can set tone style, pitch, densiity and various other settings to create the perfect tune for your mobile phone. Its free and no sign up is required. Get your ringtone in three easy steps. Upload your mp3, slelect the desired portion and download the ringtone. Its free and no registration is required. This is also a free online tool that lets you convert your wonderful collection of mp3s into ringtones for your cellphone. Process is simple. Just upload, give start/end point and save the ringtone to your computer. You can also change the sound quality and tinker with the filters. No registration required for this one. For the android users, this handy little tool is a gem. You can create custom ringtones, alarm notifications and sounds from any clip. Apart from the usual, you can also use RingDroid to record, delete, edit or assign ringtons to a contact in your phone.It supports MP3, ACC/MP4, WAV, 3GPP/AMR formats in the current version. Download RingDroid here. This tool lets you upload files from your computer and converts them into customized wallpapers and ringtones for your cellphone. You need to register for this one and then follow the simple method of upload, customize and download or even send directly to your computer. You can also checkout the stuff created by others as well. This online tool lets you convert MP3s to a ringtone and send it your cell phone. Upload, mark the start/ end and start converting. Once done, you can readily send the ringtone to your computer or directly to your mobile phone. No sign up, free to use and no limits on the number of ringtones you can create. This one requires you to sign up and then you can follow the three easy steps to get your desired ringtone. You can alos select from the vast collection of ringtones already available and also browse through quality wallpapers for your phone. You can forward ringtones to your phone if your carrier is supported.Check it here. This one also does the same. You can upload, cut the part you want and download the ringtone to your cell phone. You can also search around for some good music and videos on this site. Max length of a ringtone can be 30 seconds. Another tool to let you convert your MP3s into cellphone ringtones. This is a free service and no registration is required. There is no option of sending ringtones directly to your mobile on this web service.